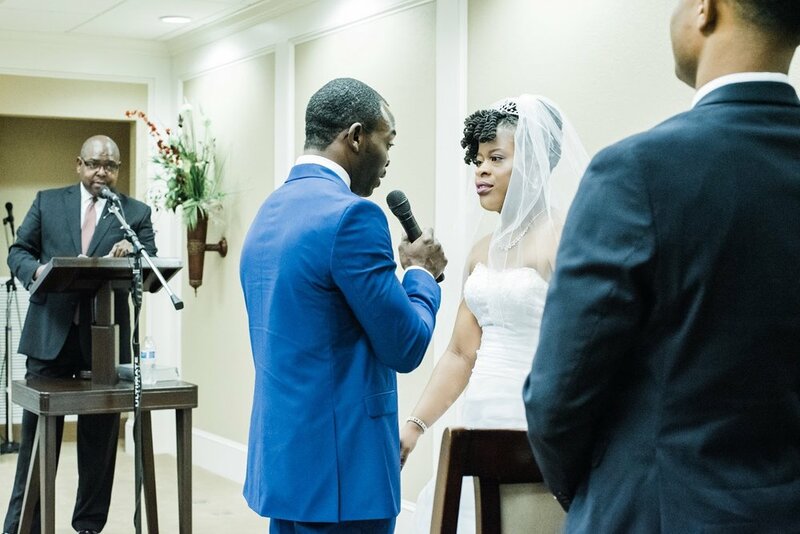 Both Kayode and Karla were looking for a life partner who shared their deep roots in faith, so a chance meeting at a Christian gathering led to a lifetime of happiness. In fact, Kayode's brother introduced the two after sharing with Karla that Kayode was ready to find a wife--and she seemed like a perfect match. Karla gushes, "We have talked every day since then!" 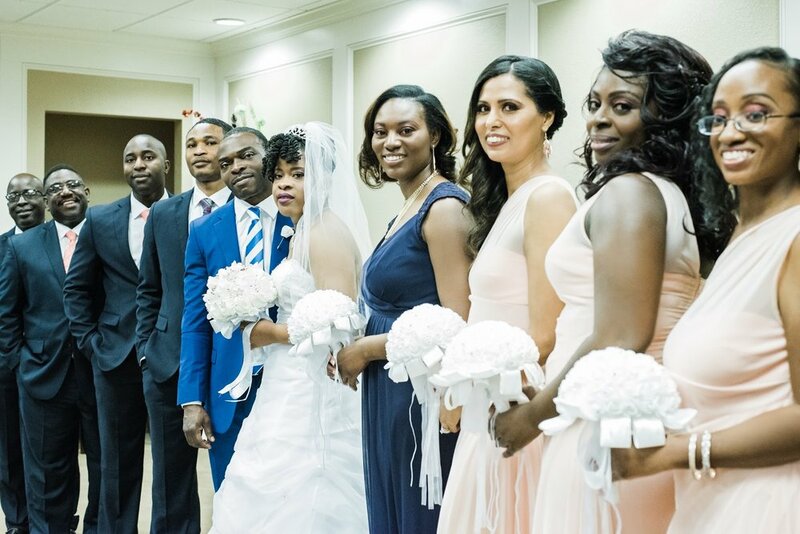 Their Charleston wedding combined their shared Jehovah's Witnesses faith with Kayode's Nigerian customs for a memorable day celebrating with family and friends. In order to showcase both their American and Nigerian traditions equally, the couple sported a suit and white wedding gown for the ceremony, then changed into colorful Nigerian dress for the reception. "We wanted something that was simple, befitting and honorable and that incorporated both of cultures," says Karla. When Kayode decided to ask Karla to marry him, he wanted to bring a touch of fun to the surprise. Instead of dropping to one knee at a restaurant or park, Kayode created a scavenger hunt for Karla. He included little hints and clues throughout and, after Karla had puzzled through all of them, he presented her with a ring and one important question. "His proposal was so romantic!" remembers Karla. During their wedding planning, Karla and Kayode needed ceremony and reception venues that provided enough room for their guests while also allowing them to incorporate their heartfelt religious and cultural elements. The ceremony location was the Jehovah's Witness property where both of them had roots. "We thought it was fitting since we are both active Jehovah Witnesses that our wedding ceremony should take place there," recalls Karla. After exchanging vows, the couple and their guests headed to the picturesque Wannamaker County Park in North Charleston. Remembers the bride, "The venue for the reception was chosen because we somewhere that was close to the ceremony and that would be good location for pictures." "Sometimes, a wedding is more than a pretty day. Sometimes it can take you to another part of the world, immerse you in their culture and leave you feeling like a better person. This is how I felt when I shared the day with Kayode & Karla. Kayode and his family are from Nigeria. Seeing them interact throughout the day was one the warmest, color filled, lively and happy things I've seen in a long, long time!" As photographer Kristina said of this garden engagement session, “I knew I was in for a once in a lifetime session!” We totally agree, thanks to the always-stunning backdrop of Magnolia Plantation, Kristina’s lovely photography, and Lauren and Zac’s palpable love for one another. When a young man calls you up and asks for your help in planning a White Point Garden engagement, you can’t help but say yes! That was the case for photographer Charlie Martin and his client Ryan, who created a romantic and completely unforgettable moment for Ryan’s girlfriend Kristen.